Neill Blomkamp established himself as one of the most exciting new filmmaking talents working in science fiction back in 2009 with his directorial debut District 9. While his follow up, the thinly veiled social allegory Elysium, missed the mark for many fans and critics, it is still a stunning movie to look at, and didn’t dampen our enthusiasm for his work in any serious way. We’re still pretty excited to see what he does next, which just so happens to be the robotic adventure Chappie, and a new poster and some photos have hit the airwaves. The film isn’t going to have any scheduled presence at San Diego Comic-Con this week, but Sony Pictures isn’t going to pass up an opportunity like this to hype up their film and get the ball rolling in the buzz department. 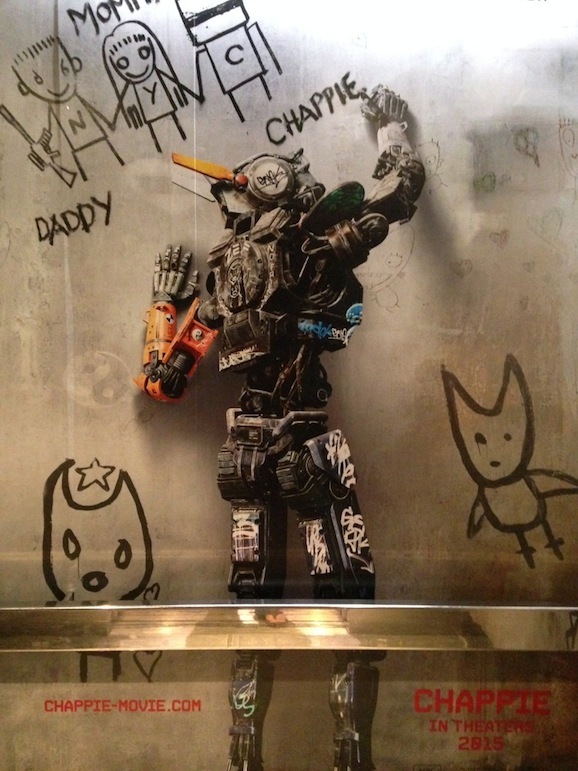 They’ve released this poster that shows the title character, the robot Chappie, scrawling some graffiti on the wall. You’ll notice the childlike nature of his attempts at art, which has to do with the main plot of the film. Described as an action, comedy, drama, Chappie tells the story of a boy who is kidnapped only to be adopted by a loving, doting family. His adoptive parents realize this boy is smart and gifted and special, and oh, hey, he’s also a robot. This explains the immature, undeveloped artistic sense, and the drawing on the walls like a petulant child. Chappie has put together a strong cast that also happens to be a little bizarre as well. Blomkamp’s frequent collaborator Sharlto Copely will play the title robot in what he calls a “poor man’s motion capture” suit. Jack of all trades, and Wolverine himself, Hugh Jackman and science fiction icon Sigourney Weaver are both set to star—you have to imagine that they play the parents in this scenario. The human cast also includes Ninja and Yolandi Visser, better known as the outlandish South African rap rave duo Die Antwoord, which should prove interesting. And there’s more. The fine folks over at Geek Tyrant snapped some photographs from inside of an elevator at the San Diego Hard Rock Hotel. 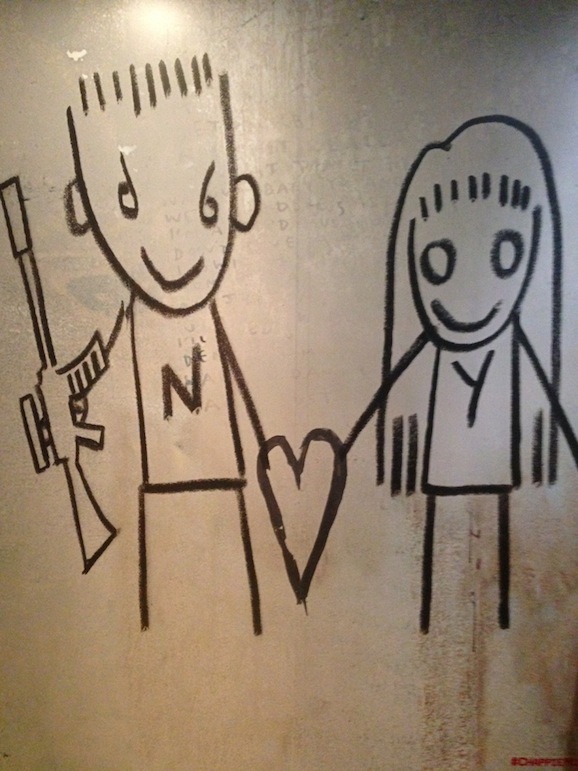 Set to coincide with Comic-Con, the walls are decorated with art similar to what you see in the poster. At first glance it looks sweet and cute, a family holding hands. 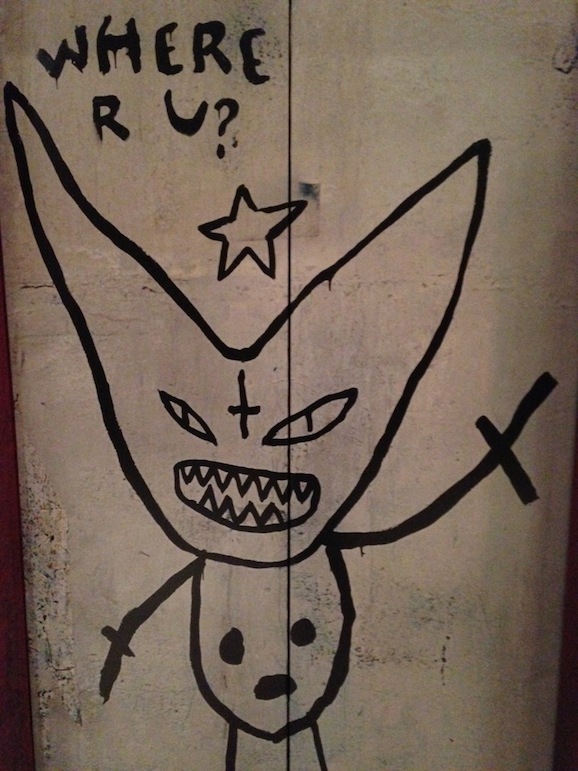 …not to mention this weird demon creature with an upside down cross on its forehead. You can’t help but imagine that things are going to take a dark turn on this journey. 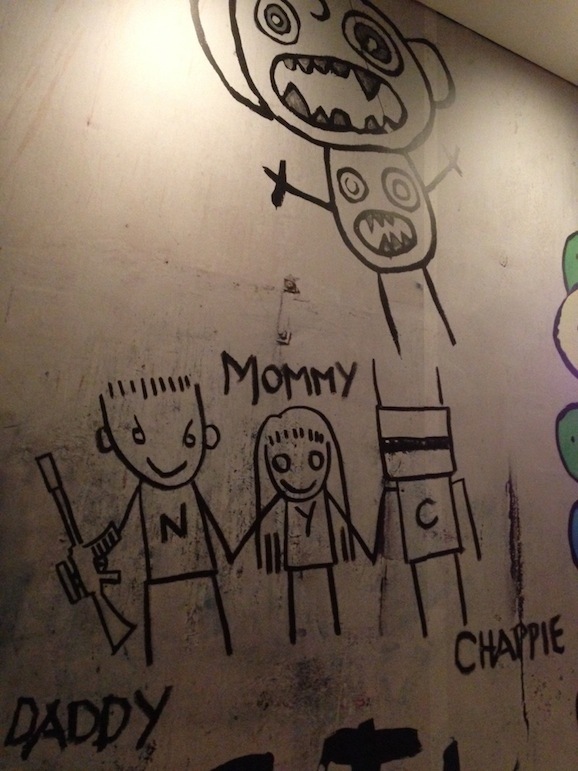 Blomkamp and company are still hard at work on Chappie, and the film is scheduled to open March 6, 2015. Check out Blomkamp’s short film that Chappie is based on to get a better idea what the finished product may look like. And here are some more pictures, courtesy of Blastr.